More records tumbled in the UK labour market this summer. On jobs, we had good news on quantity and quality as the people in full-time employment reached a record high of nearly 24 million. And this record high is all the more striking as it came alongside a record fall in the number of EU migrants in employment. 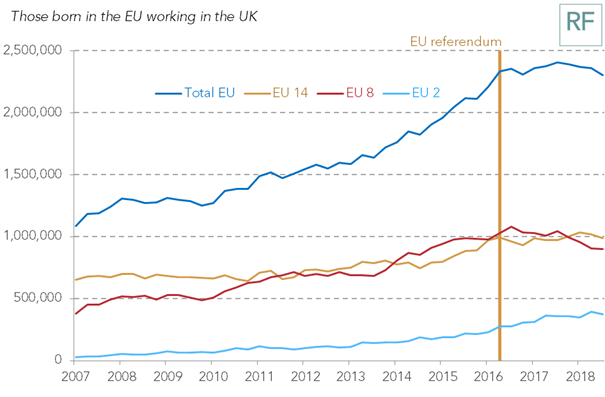 We’ve had small falls in the number of EU migrants working in Britain before, most recently in the wake of the financial crisis. But the recent fall is both sustained (taking place over two successive quarters) and sharper (falling by 4.5 per cent) than at any point since 1997. This rapid fall has been driven by workers from the EU A8 countries – the Czech Republic, Estonia, Hungary, Latvia, Lithuania, Poland, Slovakia and Slovenia – who also drove the rapid increase in migration after joining the EU in 2004. It might just be that nearly two decades of virtually uninterrupted growth in the number of EU migrant workers is coming to an end. The obvious conclusion to draw from this is that it has been driven by the vote to leave the European Union in 2016. And in some respects that is correct. The weakening of the pound (and subsequent inflation spike) following the referendum result has made it more expensive to move to the UK to live and work. EU migrants currently here may also feel the country is less welcoming than it once was, while those considering a move to the UK may worry about their status after the country leaves the EU. But broader economic and demographic forces are also at play. Improving economic conditions in the EU, the catching up of living standards in Eastern Europe, and the fact that the big expansions of free movement (in 2004 and 2014) were some time ago are also responsible. In some respects the UK may have decided to end free movement just at the time when the numbers of people making use of the right is falling significantly. Whatever the driving forces, what is clear is that change is nigh. This is happening ahead of us leaving the EU, and well ahead of us actually having a post-Brexit migration policy in place. Firms that rely on migrant workers will need to rethink who they employ, how they operate and even what they produce. Upheaval will be most apparent in those sectors that employ significant numbers of migrants and which have high staff turnover. The hospitality sector, followed by retail and logistics, are most exposed. Many firms in these sectors will argue that it is unrealistic to expect them to adapt. 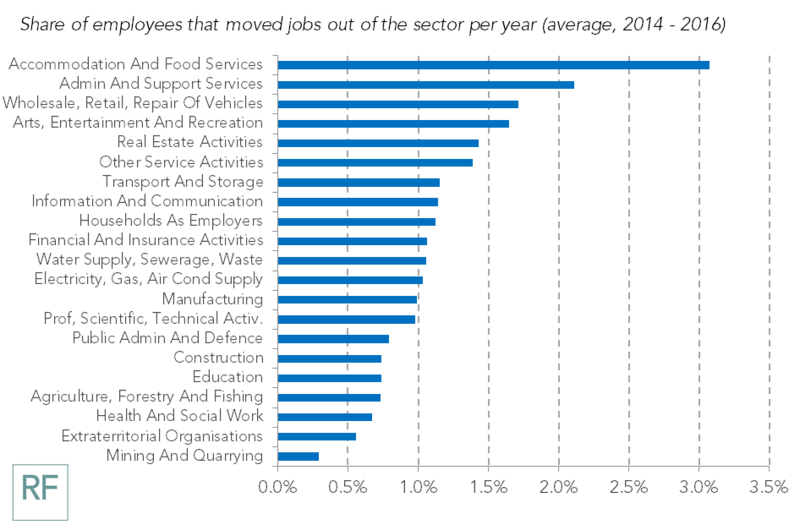 And many don’t expect to – last year we found that the vast majority of firms in these sectors expected either free movement to continue or something very similar to replace it. But while firms are justified in saying that the government needs to make it clear where our post-migration policy is heading, they’ve been given been some pretty strong clues in recent months. Following the release of the Migration Advisory Committee’s report in September, firms can no longer plead ignorance and should start preparing. Although there are some details that need to be clarified the direction of travel is clear – less lower-skilled migration and, in all likelihood, significantly lower numbers overall. Predicting the future is usually a fool’s errand. But today’s figures could signifiy a decisive shift in the UK labour market. Failing to prepare for what seems like inevitable change is now just folly.